This weekend while rummaging through my old stuff which I saved all these years, I happened to come across a yellowing vanilla envelope in which I found this picture from the distant past. See if you recognize anyone in it. 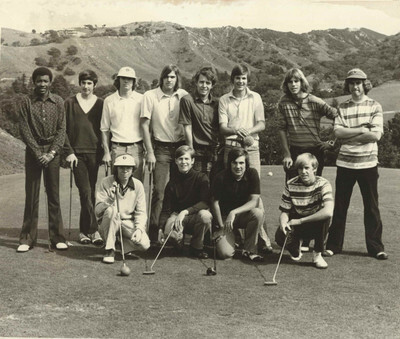 Salinas High Golf Team 1974. Those were the days my friend, and back then I had a blast playing the wonderful sport of golf with my friends. We were a pretty strong team and played well against the other posh high schools who thought they were so great. I remember all of you, but not all the names. Those were fun times Kiffin! I remember everyone pretty well, but a couple names I've forgotten. So far this blog contains no less than 2288 entries and as many as 1876 comments.